New 16 Lane Double Drop Multi Channel Tablet-Capsule Counter LED-16. 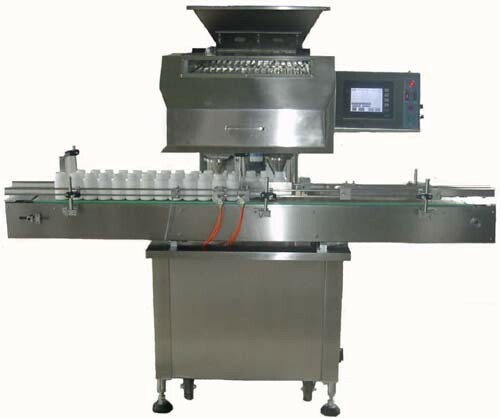 Unit is equipped with a container indexing and bottle supply sensor to start/stop the machine. This is a High Speed unit with an accuracy level of over 99%. Application Range: Sizes 00 - 5 for Capsules, Caplets plus Tablets greater than 7mm. Minimum bottle opening 25mm. Output capacity: 3000-6000 pcs/min (Depending on size of tablet or capsule). Unit comes with a Dual Lane Conveyor with indexing and Two Discharge Chutes for faster operation. Unit is designed to be disassembled for easier cleaning. Comes with Programmable Control Panel, unit is all Stainless Steel. Overall Dimension: 64" L x 50" W x 64" H. Weight: 950 lbs. Electrics: Customer to Specify. Delivery Time: approx 8 weeks from receipt of 65% deposit.